Browse: Home /	Bicycling, Intern Reports, LIVABLE STREETS, Transportation, Urban Planning / Select Bus Service Open House November 15th: Success! 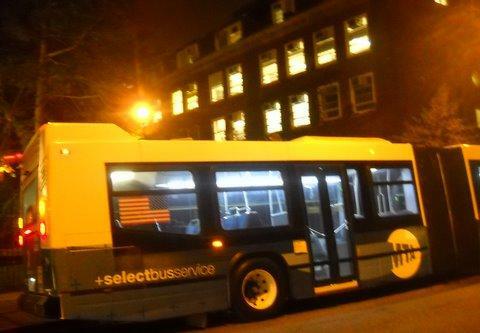 The Select Bus Service Open House at Brooklyn College was a success! The overall feel for the meeting was informal. Story boards of the project were placed on the edges of the room, leaving room for people to browse and look over the design. The story boards were well designed and easy to understand. 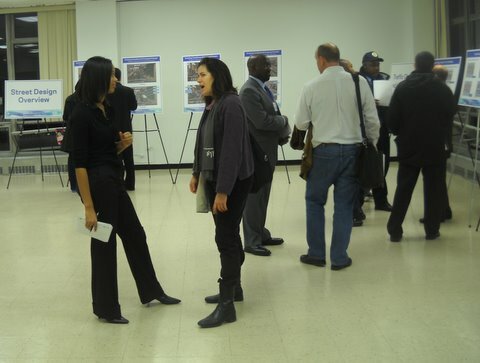 Representatives from both the Department of Transportation and NYC Transit were present to answer questions and discuss the project. Also in attendance were various community members, B44 riders, bus drivers, and even a reporter from News 12 Brooklyn! I was very pleased with how knowledgeable and open about the process representatives were. One of my major concerns was that in one section of the route on Bedford Avenue the SBS bus and bicycles run in the same lane. One representative explained that the thought behind this portion of the design was that a wider bus lane would be able to accommodate both buses and bicycles. Within the bus lane there would be lines dividing the spaces that the bus and bicycle would use. The representatives also acknowledged the problem with the design and openly admitted that it is still being discussed and possibly reworked. The highlights of the event were the delicious snacks and a working SBS bus outside of the event!